The Commonwealth’s FY19 budget process has started with the Governor submitting his recommended $40.9B House 2 budget to the Legislature in late January. With this budget, the state share of the cost of Boston’s School Department (BPS) operating budget will continue to be less than the year before. The Governor’s budget recommends an increase in Chapter 70 education aid for Boston of $1.3M or 0.6% for the FY19 BPS budget of $1.1B as recommended by Superintendent Chang. Also, the charter school reimbursement account is again underfunded, in FY19 by $27M, which brings the underfunding total to $100M over five years. Boston’s largest state aid account is Chapter 70 education aid, which in the Governor’s budget is $219.3M, an increase of $1.3M or 0.6%. Chapter 70 aid statewide in House 2 totaled $4.85B, an increase of $104.6M or 2.2%. 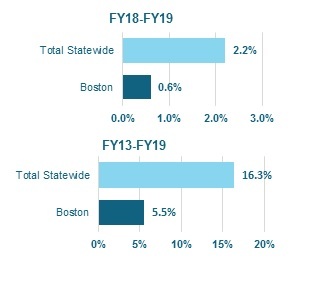 Over the six years from FY13 to FY19, Chapter 70 revenue statewide increased by 16.3%, but during that same period, Chapter 70 aid for Boston increased by 5.5%. The BPS budget increased by 25.8% in that same time. The state allocation of local aid for education for each school district is based on the “foundation budget” which is the state’s determination of what amount is necessary for each school district to adequately educate the district’s student population. Boston’s Chapter 70 aid only accounts for a quarter of its foundation budget. Even so, Boston’s education spending exceeds its required school spending by $228M in FY18. The City also holds the School Department harmless from the growing charter school tuition assessment, which totals $194.2M in House 2. In 2015 the Massachusetts Foundation Budget Review Commission issued a report that recommended that the establishment of each district’s foundation budget be revised to add more weight to the high cost of health benefits, special education, English Language Learners and low-income students. Due to Boston’s higher spending on education above the required school spending levels, even if these recommendations were implemented, Boston would still only receive minimum aid (for example $1.3M in H2) for the initial years. An alternative approach for Boston would be required so its education aid would increase consistent with other school districts if the Commission’s recommendations were adopted.